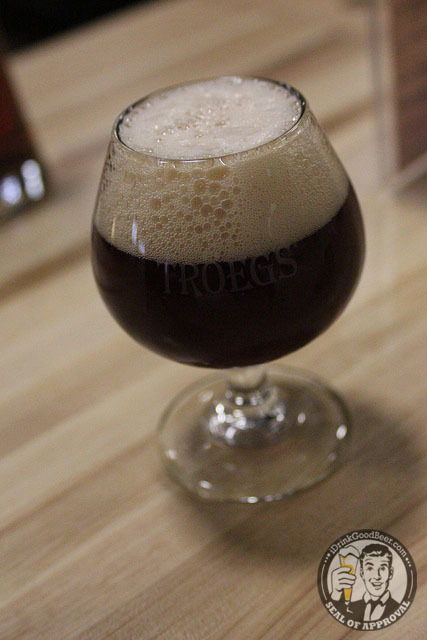 Troegs has been on my radar for quite some time now and long overdue for a visit. 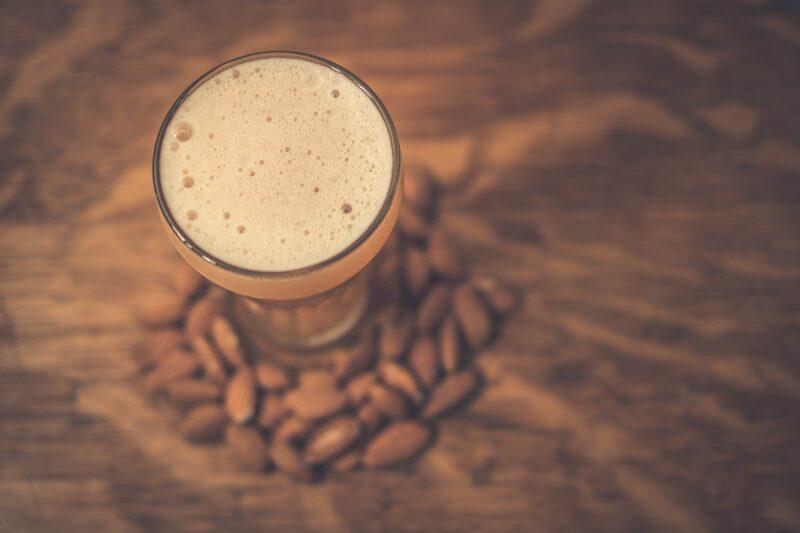 Troegs is one of the first breweries that opened my mind to the world of craft beer, the result of which drives what I am doing today with this website. 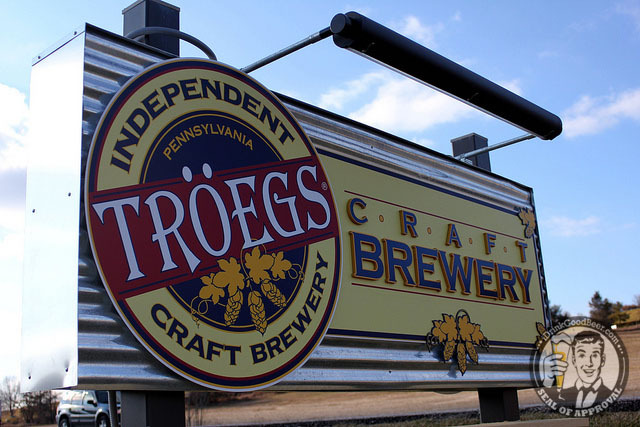 Last Wednesday, Steve and I headed westward towards Hershey PA to check out the new Troegs facility, sample some great beers, and nurture hopes of drinking Nugget Nectar from the fermenter. 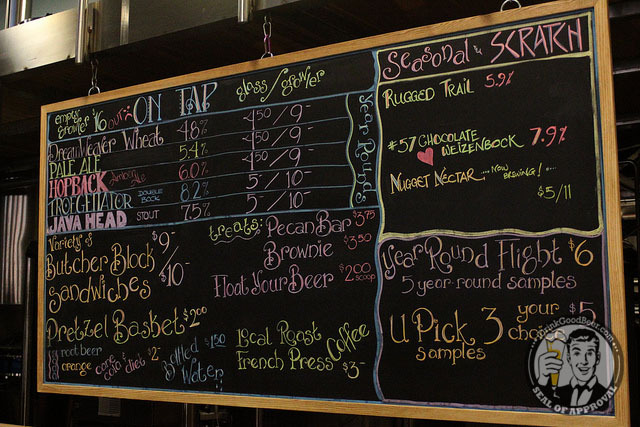 As soon as we arrived we were drawn straight to the bar, as if summoned by the massive chalk board bearing the days offerings of year round brews, seasonals, and scratch batches. I went for one of my favorites to kick it off: Troegs Pale Ale. Steve opted instead for the outstanding Hop Back Amber Ale. 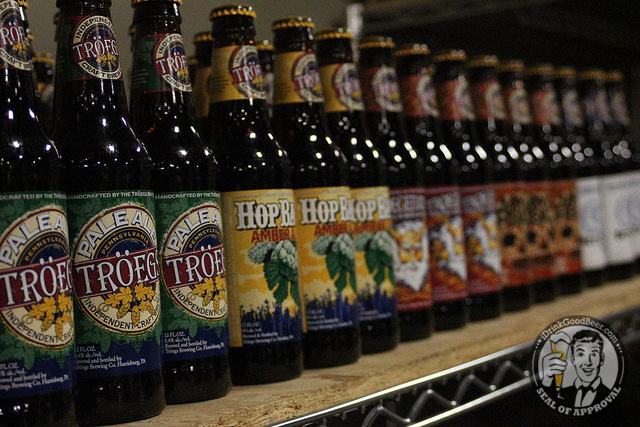 Seeing this many exceptional beers in one spot had my mouth watering almost instantly. 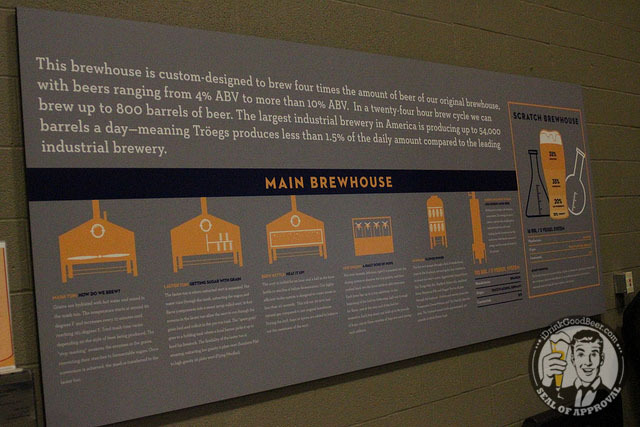 Some fun facts about the new brew house and its production capabilities. With beer in hand, we set out on the brewery tour. 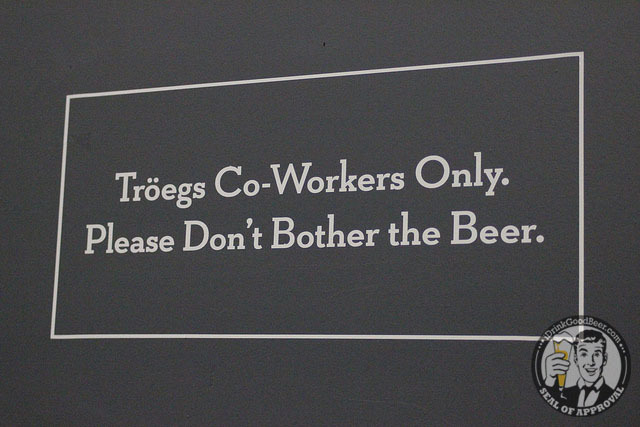 Troegs takes a different approach than most other breweries, believe it or not, the tour is self guided. 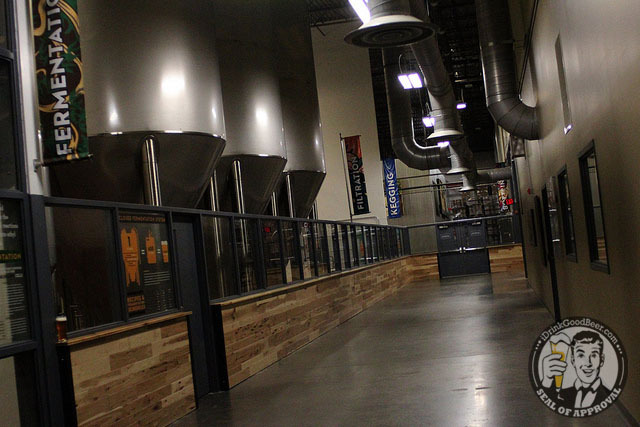 It’s a really neat way to experience a brewery. I have not been to any other facility yet that allows you to walk around enjoying the end result while simultaneously marveling at the process – until now. 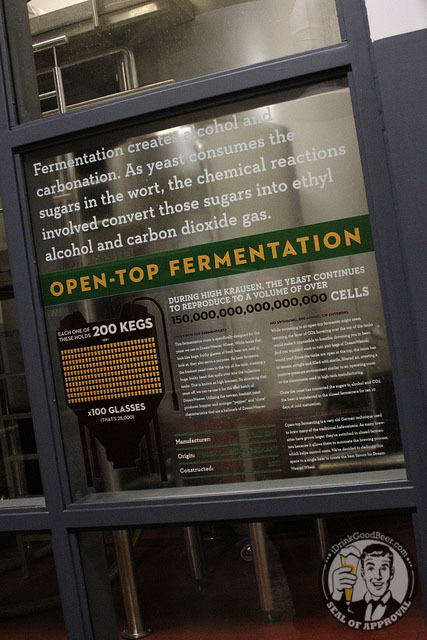 You can see all the inner workings of the brewery with descriptions and facts regarding the science behind the magic. You can’t go everywhere in the brewery, though. Thankfully the boundaries were pretty clear. We were told people hang out here for hours, often concluding the end of their tour with the the pleasure of another beer while watching the bottling line across the way. 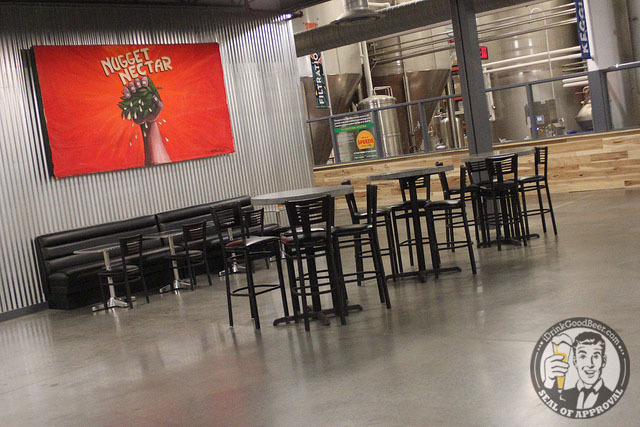 You can also see a huge piece depicting the Nugget Nectar logo hanging on the wall. 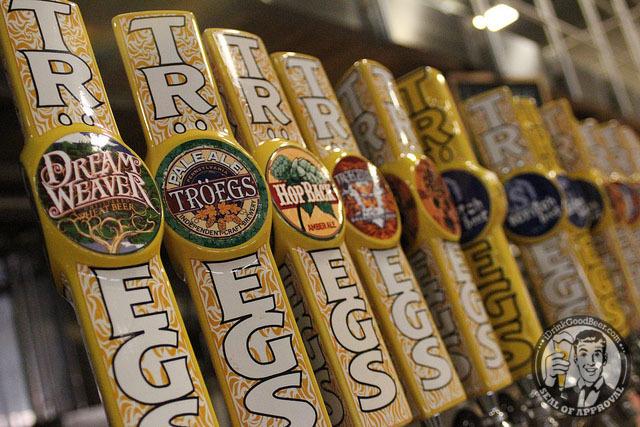 They are big fans of art here and you can find Troegs-inspired pieces throughout the brewery. 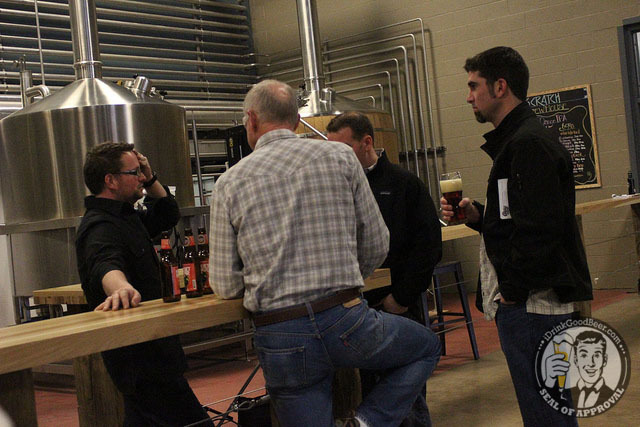 When we finished our self-guided tour we headed back to the bar to wait for the brewery manager, Ed Yashinksy. 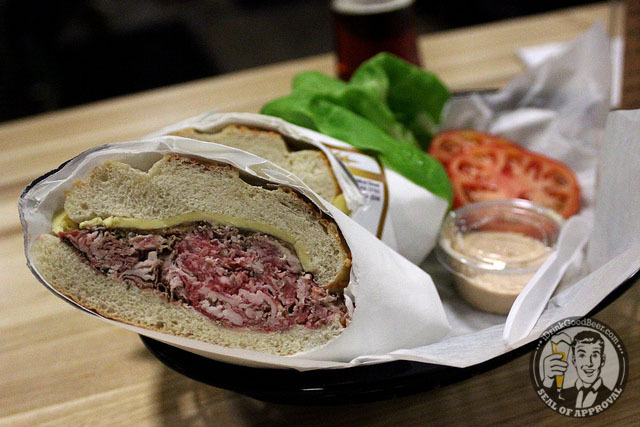 Troegs has a nice array of gourmet sandwiches and desserts to pair with your favorite beer. I had to sample the scratch batch they had on draft, as we don’t get to see these brews outside Pennsylvania state lines. 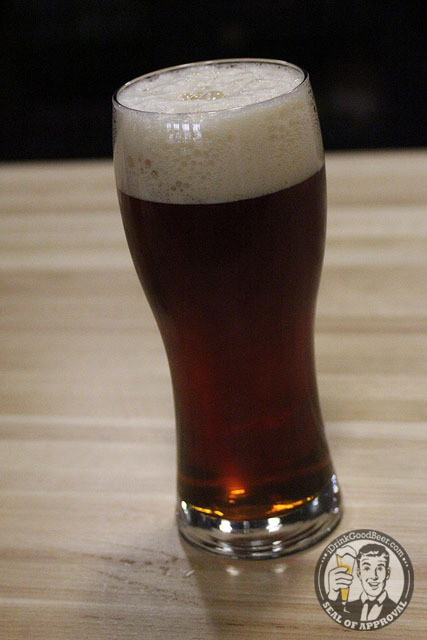 This is scratch batch # 57 – a chocolate weizenbock. Probably one of the more interesting and flavorful brews I’ve had in a while. 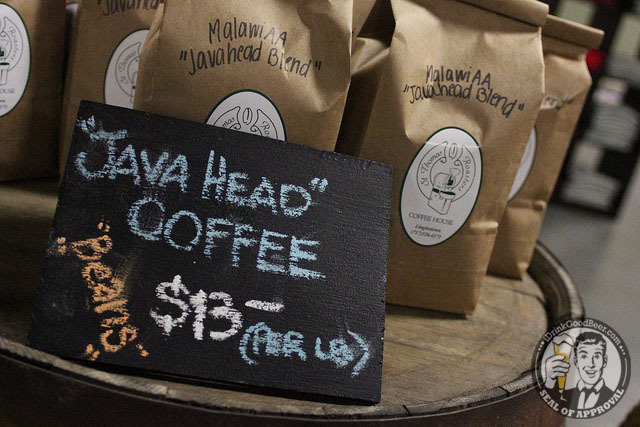 Steve ordered up Java Head Stout, which coincidentally they were brewing that day. It made enough of an impression that he grabbed some glassware depicting the artwork on our way out. I have come to find out that you never know who you will run into when visiting breweries and beer bars. The guys from Odell’s Brewing in Fort Collins, Colorado were paying a visit to John and the gang to get some ideas for their new brewery. 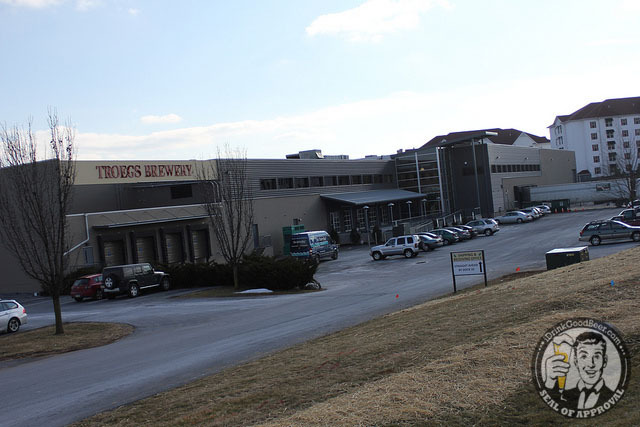 As a home brewer, John Trogner had visited Odell’s and took inspiration from their work; now things have come full circle as they travel to see his new facility. After we had some lunch, Ed took us on a little behind the scenes tour, separate from the self guided one we enjoyed earlier. He first showed us their high-tech milling room. 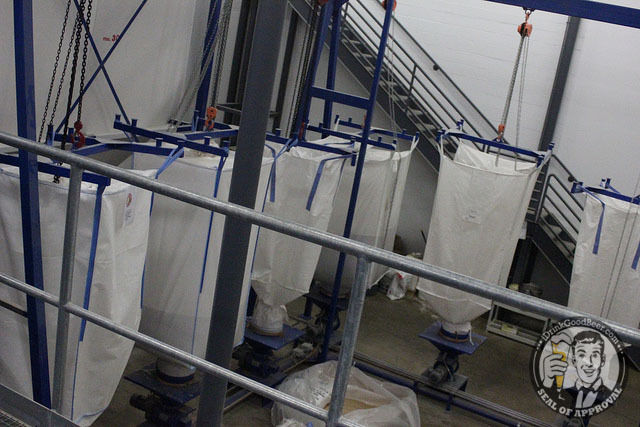 Unable to keep silos outside, Troegs houses all their grains in these huge nylon bags. 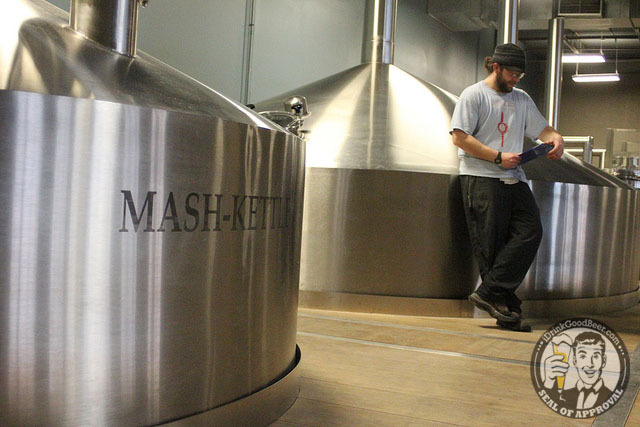 This whole system is computerized with the proper grains and amounts released depending upon the recipe, all of which is transferred directly to the mash tun after the milling is complete. 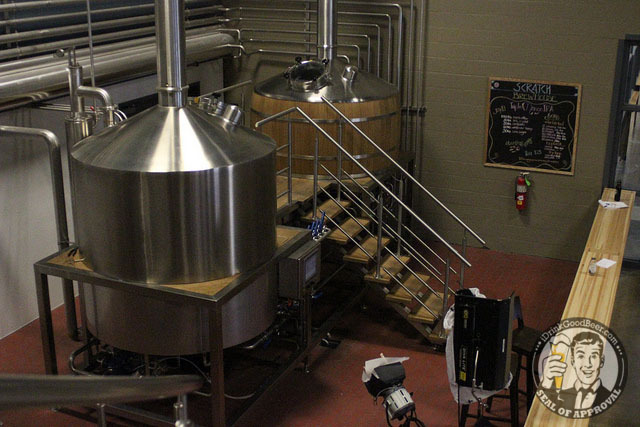 We then headed up to the brew deck where Bruce was churning out a batch of Java Head Stout. We were stoked to find out he was a fan of our site. I told you they love art here. 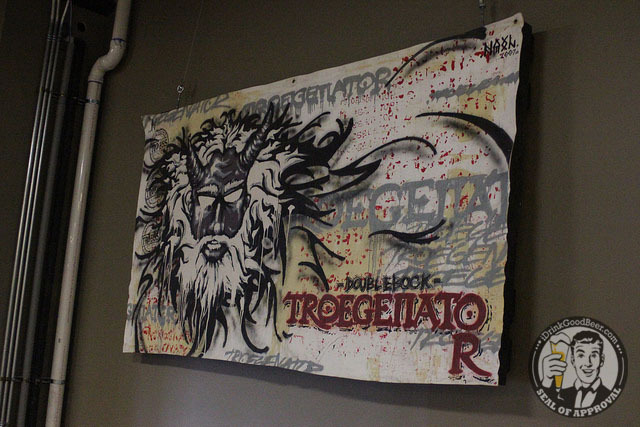 While we were up on the brew deck I couldn’t help but notice this magnificent Troegenator piece. The artist painted this one while listening to a live band at the brewery, probably drinking the delicious Double Bock for inspiration. 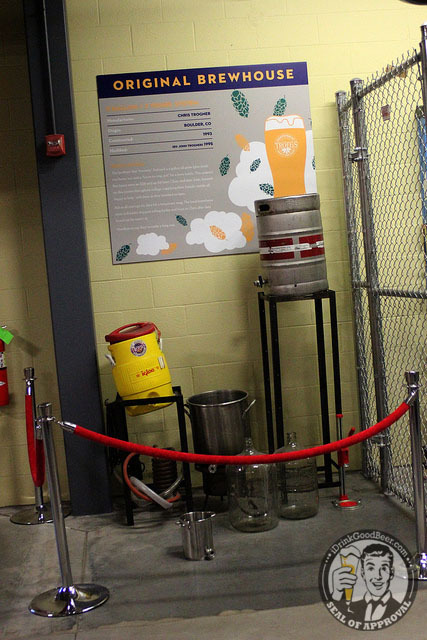 What’s even cooler than the brew house is the scratch brew set-up. 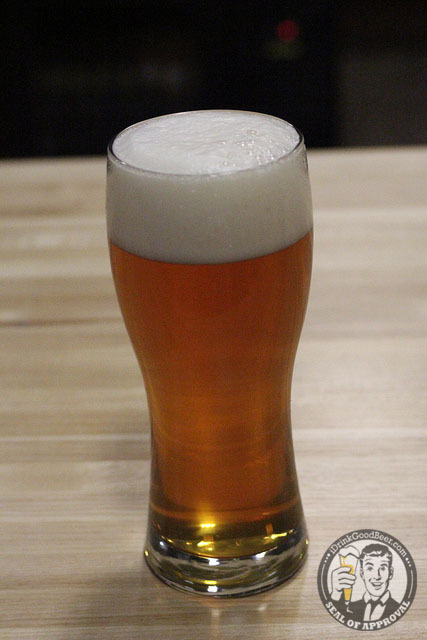 The scratch batch setup allows them to prepare small, experimental batches of beer which have ranged from Triple Mango IPA’s to a low ABV Troegenator. 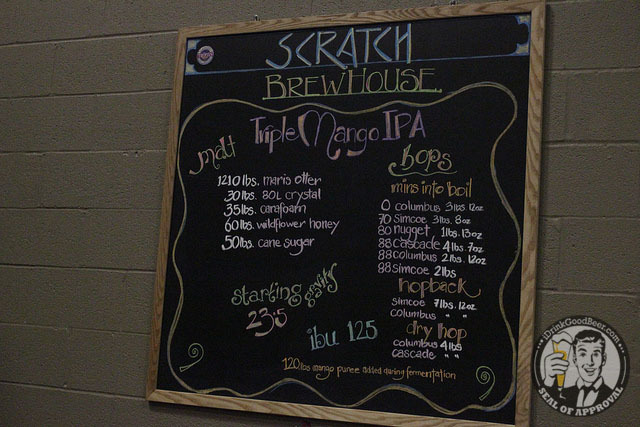 They also put their current scratch recipes up on the chalkboard, allowing patrons to see what goes into each batch. 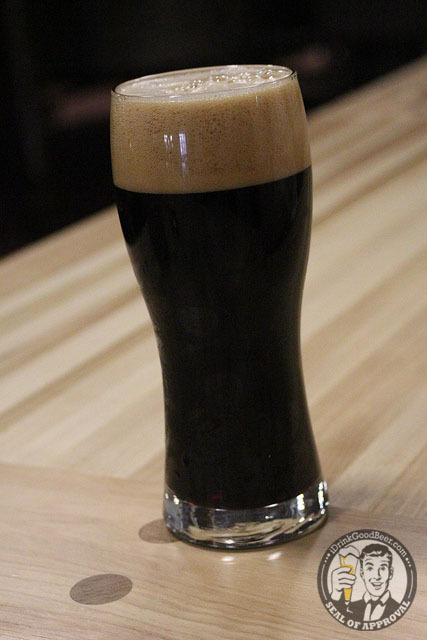 Homebrewers can scale recipes down to attempt to recreate a scratch batch they enjoyed at the brewery. 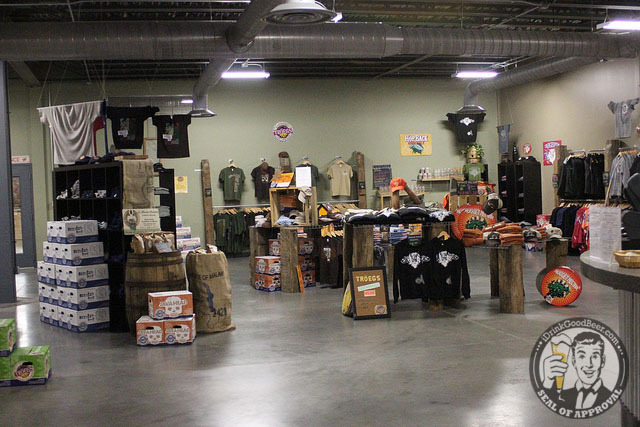 Before leaving any brewery you must visit the gift shop, or in this case, the General Store. 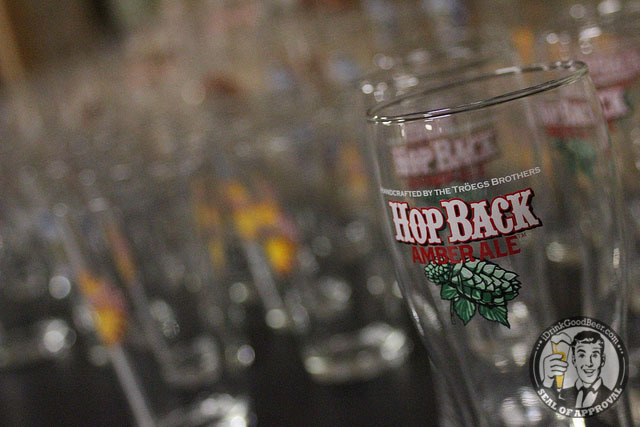 All sorts of brewery swag, ranging from make-your-own six packs to glassware and shirts were available. 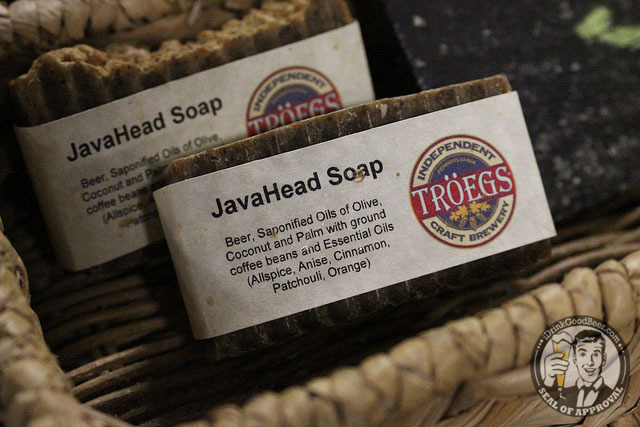 They also had Java Head Soap and coffee beans available for purchase. 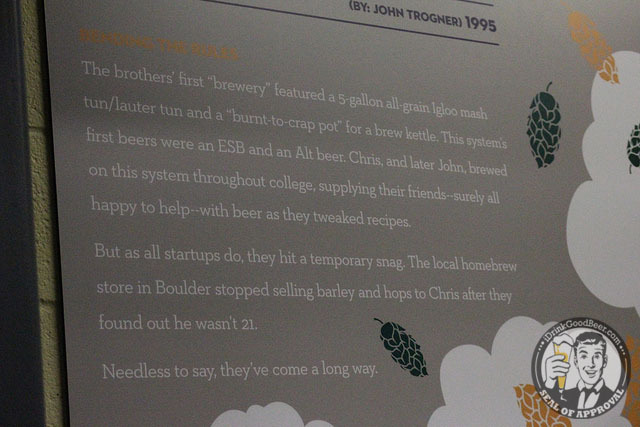 The General Store also proudly displays the very first Troegs “brew house” along with a little history lesson. I could not think of a better way to spend a Wednesday afternoon. Â Thanks to Ed, Mat, John, and the rest of the staff for their warm hospitality. Although our fantasies of drowning in Nugget Nectar went unfulfilled, we are admittedly glad in retrospect – the anticipation will make that first bottle of the season all the sweeter. In the meanwhile, this trip certainly reaffirmed that Troegs masterfully produces some very satisfying beers to tide us all over in the interim.